Odisha has a rich maritime heritage, dating back to as early as seventh century BCE and continuing till fourteenth century AD. In those good old days of yore, erstwhile Kalinga (as Odisha was known back then) was regarded as a formidable maritime power and had flourishing trans-oceanic trade relations with several South East Asian nations. The seafarers of Kalinga, known as "Sadhabas", were noted for their maritime prowess and actively conducted trade across the 'Kalinga Sagar' (Bay of Bengal was known as 'Kalinga Sagar' back then), sailing to far off places in South East Asia like Bali, Java, Sumatra, Borneo and Ceylon for trading. This has been embodied by several archaeological findings, epigraphic evidences and literary texts. 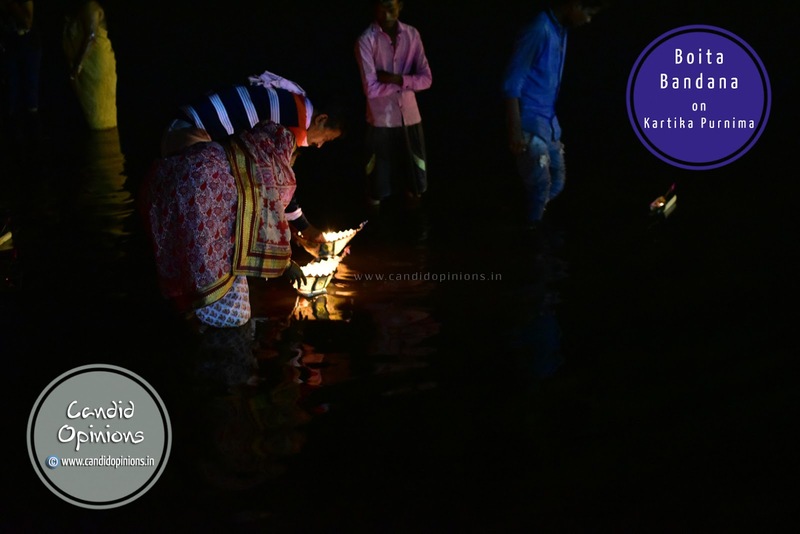 'Boita Bandana' (Boat Worshiping festival) is one such socio-religious ceremony that bears testimony to Odisha's glorious maritime history. 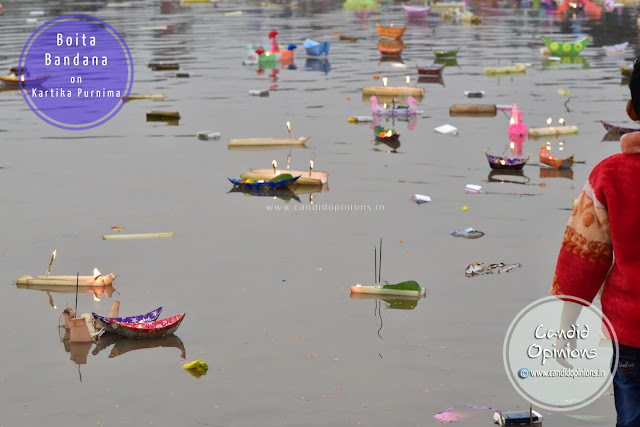 Back then, it was on the full moon day of Kartika month (Kartika Purnima) when the "Sadhabas" would start their sea voyages to South East Asia (then known as Suvarnadwipa and Suvarnabhumi). 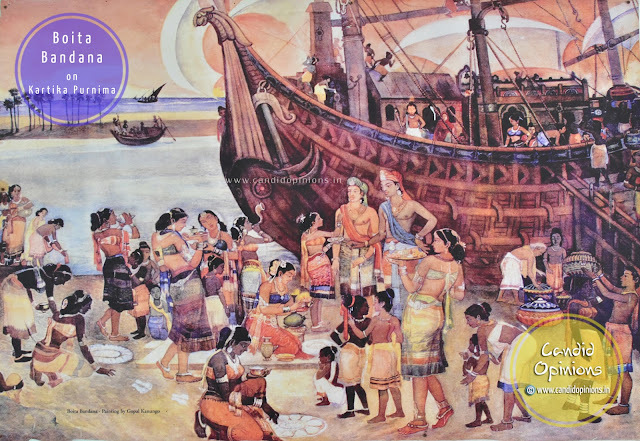 But before they embarked on their voyage, the womenfolk of the Sadhaba families would perform a customary puja to pay obeisance to Goddess Mangala (the sea goddess) and so also would sanctify the "boitas" (their ships) so that their men would return back safe and sound. Though we have come a long way from those ancient times and modernity has gradually seeped into our lives, but even to this day, the people of Odisha continue to follow this glorious tradition of 'Boita-Bandana' with great enthusiasm and religious fervour and cherish the memory of the bygone era. 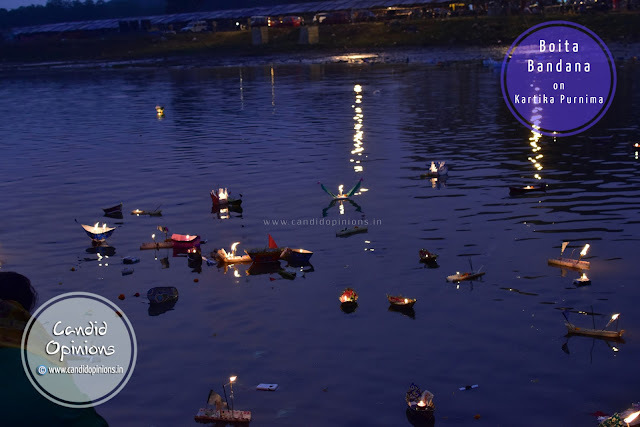 In the early morning hours of Kartika Purnima, preferably before dawn, lakhs of Odias (men, women and children) throng the water bodies (rivers, ponds or sea) and perform Boita Bandana by floating small boats made out of hollowed-out portion of plantain stems or paper and thermocol and placing lighted earthen lamps and lamp sticks in those boats, along with flowers and 5 other items - a betel leaf, crushed betel-nut, a few rice grains, a few grains of black urad dal and black sesame seeds. This ritual is accompanied by the blowing of conch shells and chanting of "Aa kaa maa boi, Paana gua thoi, Paana gua tora, Maasaka ra dharma mora". This ritual also marks the end of the month long observed "Kartika brata". Many devout hindus believe that those who observe "Kartika brata", renouncing non-vegetarian food and certain vegetables during the entire month, and take a dip in the sea or a river or a pond on this day (Kartika Purnima) followed by a visit to the temple early in the morning, get absolved of all sins and upon death, their soul would attain salvation.